Rio Verde is a fun active adult community. Asides from having two beautiful golf courses, there is much fun to be had here. You can go swimming, hiking biking and more. To get around Rio Verde resident are using their bicycles or even golf carts. Of course, at the end of the day you need a place to put those bikes and golf carts and where do you put them? – In your garage. But such an active lifestyle can take quite a toll on the state of your Rio Verde garage floors. If you want your garage floors to be as beautiful as the floors inside your home, you need to work with a garage floor coating specialist who can assist you in protecting your garage floors from the signs of daily use as well as make them look stunning. Barefoot Surfaces has been providing the Rio Verde community with top notch floor coatings for your concrete garage floors. Our unique epoxy and polyaspartic floor coating blends not only will allow your floors to stand the test of time, but make them the envy of your neighborhood as well. Our most popular Rio Verde garage floor coatings are our polyaspartic and epoxy coatings. Why? They are extremely durable as they form a strong bond with the substrate while also being chemical and wear resistant. That means they are truly capable of taking a beating without falling apart under pressure. These coats are what you should be thinking about when you hear the expression “performance floor coats”. They hold up to daily traffic very well. Additionally, they release dirt easily which makes them a breeze to clean up and and easy to maintain. This is a huge bonus when you live in a community as active and outdoor-oriented as Rio Verde. No matter if you are looking for a Rio Verde concrete floor coating that can make your garage floors easy to tidy up and keep clean or if you are suffering from boring flooring, Barefoot Surfaces’ epoxy and polyaspartic floor coats are the cure. Our coats come in a multitude of chip blends and color variations and are sure to liven up any garage. If you are looking for some glamour or sparkle- we have just the thing; our metallic epoxy coats will dazzle you day after day. Our concrete stains are another popular and great floor coating alternative. They are a fantastic choice if you are worried about the safety of your family and the environment. They may be low VOC but pack a punch when it comes to color vibrancy, because they have excellent color penetration and are UV resistant. This means they will look awesome year after year, even in a sunny place like Rio Verde. Like Barefoot Surfaces’ other floor coatings they are easy to keep clean; a wet mob or a broom is all you need to keep your Rio Verde concrete stained garage floors in top shape. We can give your beautiful concrete floors-without a lot of work. Our concrete stains are made to last and the cure for common garage floors. Make your garage floors the envy of Rio Verde with a quality concrete stain floor coating by Barefoot Surfaces. To learn more about our concrete stains and to find out if they are a great choice for your home, contact the experts with Barefoot Surfaces. Of course our coats are great for interior flooring solutions (such as kitchen, living room or bathroom floors) as well. If you enjoy a garage floor that looks a bit more puristic and modern than our epoxy coats, you may want to consider having us grind and seal your Rio Verde concrete garage floor. Grinding and sealing is a great way to smooth your floors and polish them to a soft sheen. Aside from looking cool and edgy, it makes your concrete floors easy to clean as well. As you can tell, we do not think that you should have to exert yourself in the attempt of keeping your garage floors clean, we believe that easy clean ups make life easier for everyone. And your garage flooring much more enjoyable. Another benefit of grinding and sealing is that there is no cure time, meaning, you can use your garage again as soon as Barefoot Surfaces is done with your flooring treatment. And if you decide you want to add some color, you will be happy to hear that we can add any stain to your grind and seal floors and give them that certain something that you have been looking for in garage floor coatings. If you are looking for a floor treatment that is timeless and pure-this is the one you want. Regardless which type of high quality floor coating you decide on for your Rio Verde garage floors, epoxy, polyaspartic, concrete stain or grind and seal, you will have garage floors that not only look great but last for years to come. Don’t let your garage be the forgotten room of your home. By spending a little bit of money on a concrete floor coat you can protect the investment you have made in your home, and increase the odds of selling it, should you ever decide to go that route. Of course, Barefoot Surface concrete floor coatings are suitable for surfaces inside your home as well. If you or a family member are dealing with allergies, you know how detrimental carpet can be. Staining your concrete to make it look great and easy to care for, can reduce the symptoms of allergies significantly. We have coated living room floors, kitchens, bathrooms, decks and more. 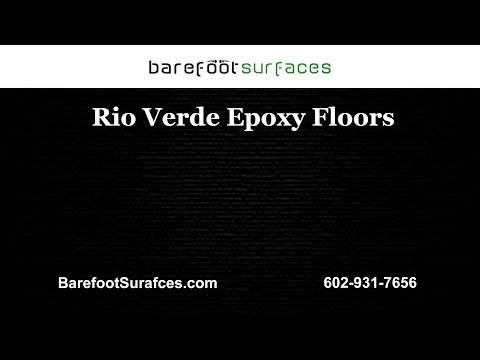 Contact us today to discuss your Rio Verde floor coating project.